Never leave your valuables behind with this loss prevention technology. Find’em Tracking officially launches today as the most advanced and thinnest Bluetooth tracking device on the market. Specifically designed for use in wallets, bags, purses and luggage and at only 2.4 mm thick (the thickness of two credit cards), this product helps users easily keep tabs on their identity. Used with the free Find’em Tracking mobile app, this innovative tracking device uses Bluetooth 4.0 technology to alert the user when they are about to leave valuable belongings behind. The mobile app is integrated with Google Maps to help users locate the last place their phone and wallet were together to give users the exact location of where they last had their card and valuables. Another benefit of this premium Bluetooth tracking device is that it can notify users at airports with an alert for when their luggage is out on the baggage carousel so that picking up baggage is hassle free. Instant Loss-Prevention Alert – Set the distance from 10-150 feet and get an instant alert once out of range. Reverse Tracking – Find’em Tracking card has a button to make your phone ring if users can’t find their phone. Find’em Tracking Radar – Precise radar will indicate the radius between the user and their valuables and guide the user to find their valuables. Google Maps GPS – If for any reason the user doesn’t notice the alert go off or their wallet is not within tracking distance, use integrated Google Maps to find the last specific GPS location. Luggage Tracker – Alerts users when their luggage is ready to be picked up from the baggage claim terminal. Software languages – Available in English, Spanish, Russian and French. 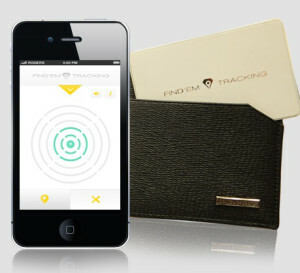 To find out more about Find’em Tracking and to order the device, visit: www.findemtracking.com. The app will be available in the Mac App Store and Google Play store and works on the latest iOS and Android devices. The Find’em Tracking team consists of a team of experts with decades of experience as electronic engineers, mechanical designers, and hardware and software developers in commercial, military and global brand projects. With this experience, Find’em Tracking has made the most precise Bluetooth tracking device, while also achieving the world’s thinnest loss prevention device. Visit Find’em Tracking online at www.findemtracking.com. Next Entry: MUST HAVE PRODUCT for Anyone On-The-Go! MyPowerPebble! Next Entry MUST HAVE PRODUCT for Anyone On-The-Go! MyPowerPebble!